The election of Parti Québécois governments created convulsive events for Quebec Anglophones, but it allowed a new generation of community leaders to emerge. Royal Orr, 59, was one of the youngest among this cohort. 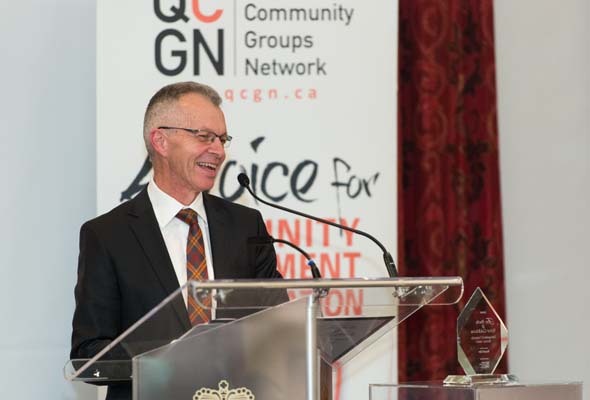 His role in providing leadership during this critical period, much of it as a busy volunteer, was recognized by the Quebec Community Groups Network (QCGN). The former president of Alliance Quebec, high-profile CBC and CJAD broadcaster and community activist was among the recipients of this year’s Sheila and Victor Goldbloom Distinguished Community Service Award. Orr still volunteers at the highest levels, with Bishop’s University and the Montreal City Mission, even as he pursues a successful career as strategic communications advisor and trainer, and as a senior faculty member of the Canada School of Public Service in Ottawa. Getting there has been no simple matter, especially when he was a key player at Alliance Quebec and the language wars were on. “It’s pretty impressive what we’ve managed to do over the last three decades in the face of challenges that could have torn us apart,” he says. Born and raised on his family’s farm in Milby, just south of Lennoxville, Orr was only 20 when the first PQ government was elected in 1976, but by the time he had completed university studies at Bishop’s and McMaster Universities, Quebec Anglophones were in crisis. In the fall of 1979, Orr, who was juggling sheep farming and teaching, joined the board of the newly-formed Townshippers’ Association and soon enough became its executive director. Under his watch, the Alliance provided financial and legal support in challenging Quebec’s French-only commercial sign rule. By then Orr was a high-profile figure and CJAD hired him to run its morning call-in show. “CJAD at that period was just a fabulous experience of what radio had been in its golden age,” he recalled. Orr then moved to CBC radio to host Cross Country Checkup and then the Daybreak morning show, but the daily commute from the farm became an impossible grind. His next gig, lasting ten years, was producing documentaries for Vision TV, the national cable TV program of the United Church of Canada, based in Toronto. “It was the most fun of any job I have had,” he reminisced. He covered third-world poverty, displacement, and disease in Gaza, the Philippines, Nicaragua, and Tanzania. In more than 15 trips to southern Tanzania, he was instrumental in helping bolster services for those with HIV/AIDS and working with local nurse Betty Liduke and Madeleine Buck of McGill University’s School of Nursing to promote rural health education. Buck credits Orr with “motivating people to do what they thought they could not do, rallying resources when no one thought they were available, networking with people with whom only a skilled communicator could network. Be the first to comment on "Activist, broadcaster Royal Orr wins Goldbloom Award"